In September 1943, the Italian government under General Badoglio signed an armistice with the Allies. The Germans, however, were well aware of the negotiations and were prepared. German troops freed Benito Mussolini from imprisonment and took control of North and Central Italy. Under “Il Duce’s” leadership, the Italian Social Republic (Repubblica Sociale Italiana or RSI) was formed, along with the National Republican Army (Esercito Nazionale Repubblicano or ENR). The new army was given the task of cleaning up the area of partisans. But, by 1944, there was a catastrophic shortage of armored vehicles. This forced the RSI to look for alternatives, like using the all-wheel drive chassis of artillery tractors or trucks as a basis for new armored vehicles. 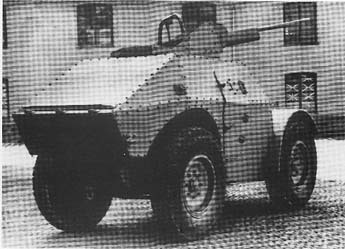 The Army requested a reconnaissance and combat armored vehicle that would use the simple AB40/41 chassis and the AB43 hull, which were still produced under German control. However, the AS43 was developed instead and produced in 1944 by Viberti. A few were built, but the exact production records are unknown, some sources stating as few as only two vehicles being built. The submitted design was approved on 28 January 1944 and production started in April. 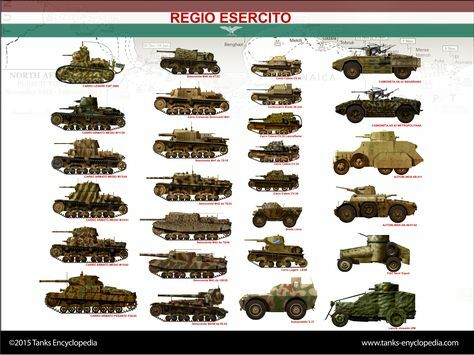 These were assigned to the armored Group “Leonessa” of the National Republican Guard and used to fight partisans in Piedmont. The AS43 used a modified TL37 chassis. 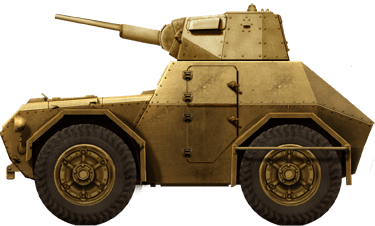 However, the whole armored body and engine were taken directly from the FIAT SPA S37, which had good off-road capabilities thanks to its very large roadwheels. The armored body was roomy enough to carry a few infantrymen, but the real addition to the design was the adoption of the AB41 turret. It was also apparently possible to install an RF-3M radio with a whip antenna. The armored sloped hull was made of uniform 8.5 mm (0.33 in) thick plates, protecting from light machine-gun and rifle bullets. The Carrozzeria Speciale AS43 was based on the Autoprotetto S37 one, but modified and tailored for the new vehicle. The cab could be accessed through two two-fold side doors and the rear of the vehicle was completely redesigned. The front compartment housed the driver and the commander. Behind it, the main fighting compartment housed the gunner and 10 loading racks for the 20 mm (0.79 in) ammunition and 6 racks for the 8 mm (0.31 in) ammunition. The turret was placed on top of the fighting compartment. It was the same turret that was used by the L6/40 light tank and the AB41 armored car. The main weapon was a 20 mm (0.79 in) Breda 20/65 Modello 1935 autocannon. The secondary weapon was the classic 8 mm (0.31 in) Breda Modello 38 coaxial machine-gun. The AS43 was powered by the SPA 18VT, 4-cylinder, 4053 cc liquid cooled gasoline engine that developed 67 hp. It was fed by a 120-liter fuel tank. The transmission included a propeller shaft, a 4-speed transmission and mechanical brakes. It had 4×4 drive which, combined with the exceptionally large roadwheels, gave excellent off-road characteristics. This was a typical Italian solution for non-tracked artillery tractor. The axles had individual spring suspension at the front, and leaf suspensions at the rear. The overall idea was to produce a sturdy car that was cheap enough for mass production, as it used the largest possible number of parts from other tanks and armored cars, maximizing standardization. However, there was no mass-production, and the numbers produced can be deduced from a few photos, only showing a couple of vehicles. Two were shown at a parade in Torino on May 9, 1944. Also two were given to the second and the third Company of the Leonessa Group in May 1944. They were attached to the “Manganiello” Black Brigade in Valtellina during the last month of the war. They were based at the barracks of Dabormida (Dabormida) near Turin. The performance and capabilities of the vehicle are not recorded. A possible problem point would have been the stability, as the vehicle was tall and possibly top-heavy due to the turret. Paolo Crippa, La AS43 blindata. L’ultima autoblinda italiana della Seconda Guerra Mondiale. “I reparti Corazzati della Repubblica Sociale Italiana”, Marvia Edizioni, Voghera (Italy), 2006. The AS43 in Leonessa’s standard sand yellow color. This scheme was used by the unit until January 1945. Afterward they might have received a camouflage scheme made of green and brown spots on top of this. A parade in Torino in 1944, showing two AS43 and an AB43 in the background. 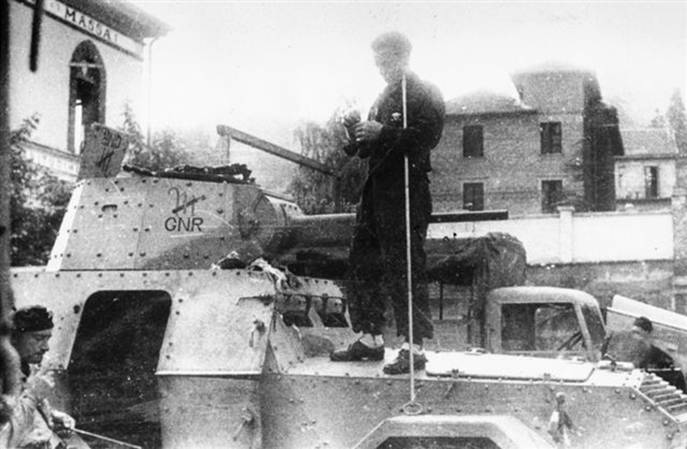 Closeup of the vehicle with the GNR Leonessa group initials on the turret and showing the open side door. A rare photo showing what looks like a initial prototype with a shielded 20 mm (0.79 in) gun instead of the regular turret. This vehicle is sometimes called TL 37 Autoblindo Africa Settentrionale on the internet. Notice the rounded mudguards, betraying the use of a modified SPA 37 hull. On the photos of the AS43, these are angular.